The Professional Library staff hosted an Authors' Reception each year to acknowledge the efforts of the staff for mental health education and research in their writings. Authors' reception at the Menninger Clinic in Topeka, Kansas - A booklet was published each year listing all the Menninger authors. 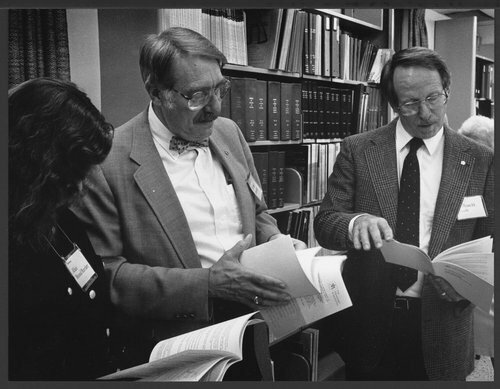 This photograph shows Dr. Walt Menninger; Alice Brand Bartlett, chief librarian; and William H. Smith, chief psychologist, looking over the booklet.